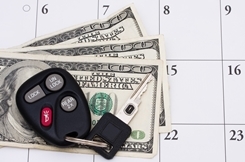 Focusing on Monthly Car Payments Can Lead to Deception | The Consumer Law Group, P.C. When you are looking to buy or lease a new or used car and cost is an important factor, you have to beware of tactics salespeople and dealers will use to get every possible penny out of you. One of these tricks involves distracting you by focusing only on the monthly payment you will owe, rather than the bottom-line cost and what exactly you are paying for. Dealers are shrewd about how they handle this, so watch out for these common, but deceitful, practices. Extend the loan. A salesperson can get a lower monthly payment for you by simply extending the length of a loan. For example, you state that you don’t want to pay more than $500 a month. At today’s standard rates on a 5-year loan, that means you should not pay more than $27,000 for a car. However, by extending the loan to 7 years, the salesperson could get you into a $36,000 car. When you only focus on the monthly payment, you may fail to realize that you are actually spending $12,000 more over two additional years for the car. Low-ball the trade-in. If you are trading in your old car, the salesperson may low-ball the trade-in offer and spread the actual value over the length of your loan to lower the monthly payment. For example, if your trade-in is actually worth $5,000, the dealer could offer you $2,000 and then take $50 off per month on your payments. If he does not tell you he is doing this, he is being dishonest. So it is very important to know that the trade-in value of your car is BEFORE you begin negotiating to buy a car. If you are only looking at the monthly payment part of the sales contract, you may not notice that the dealer has hidden add-ons like service contracts, rustproofing, paint protection, and more that you did not ask for. Because the monthly payment is not itemized in any way, you don’t really know what you are paying for. One way to find this out is to ask the finance manager to give you your monthly payment with only the car being financed. Then you can ask what the payment would be with the other things you want to add. In order to avoid being deceived by the salesperson, you should negotiate based only on the total purchase price of the car. Do not tell the dealer what you are hoping to make in monthly payments—focus only on the bottom-line cost. Also, negotiate any other aspects, such as the trade-in value and add-ons you actually want, separately from the purchase price. Only in this way can you know for sure what you are paying for the car. Our attorneys offer these tips to protect consumers against auto fraud. If you feel you have been the victim of auto fraud, please fill out the form on this page and we will get back to you shortly.